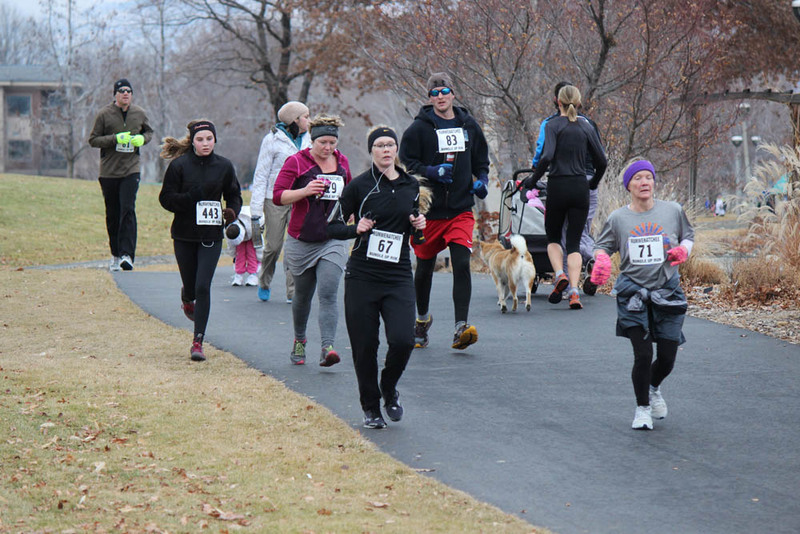 Bundle-Up 5K participants move along the Apple Capital Loop Trail in Riverfront Park on Saturday, Jan. 25. 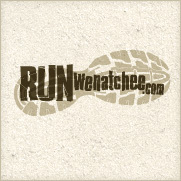 WENATCHEE — Running shoes. Check. Gloves, beanies, leggings? Check. Check. Check. Bundle-Up 5K runners and walkers leave from the Stanley Civic Center at the start of the event on Saturday, Jan. 25.
celebration at the Stanley Civic Center Plaza. Barry Hodges was the “official unofficial” winner of the men’s race, and Marlene Farrell collected the same honor on the women’s side. 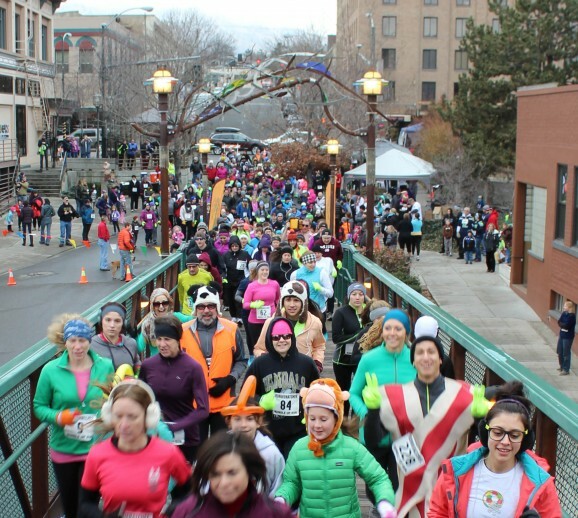 From the plaza, the course took runners and walkers across the Riverwalk Crossing Bridge, north on the Apple Capital Loop Trail to Walla Walla Point Park, and then back. Participants weren’t timed, although there was a running clock at the finish line. But as the first two years of Bundle-Up have illustrated, it isn’t so much about racing to win as it is about taking part to have fun. Even if the temps are in the 30s, as they were Saturday, and most everyone is covered head to toe in various items of clothing, including costumes. As Pierce headed off to the beer garden outside Saddle Rock Pub & Brewery, others mingled among the crowd at Winterfest. Activities in the plaza included a fire pit, where people could roast s’mores, a petting zoo, and appearances by L-Bow the Clown. 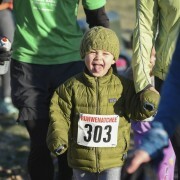 Of the 505 participants, about 50 were young children who took part in the 1K kids race. Icicle Brewing Co. and Saddle Pub & Brewery co-sponsored the run and walk. 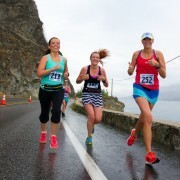 Event beneficiaries were the Wenatchee High School Track Team and Cross-Country Team. About a dozen WHS athletes volunteered. 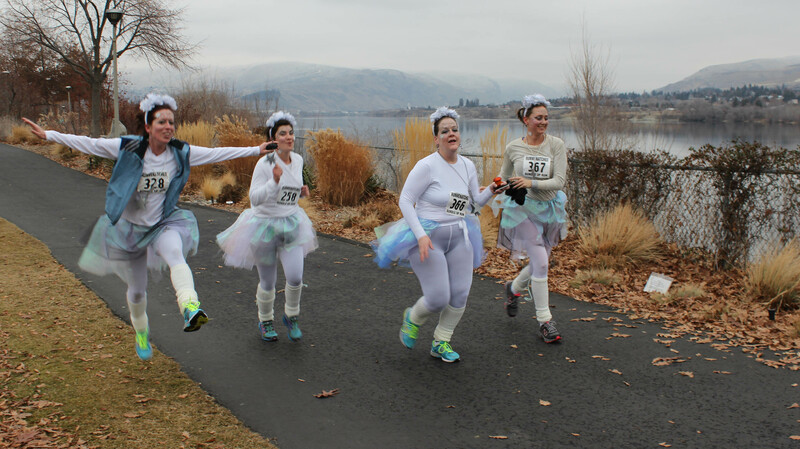 Winning the top prize in the Bundle-Up Run costume contest were the “Ice Queens” — Alicia O’Dell of Wenatchee, Jessica Matthews of Omak, Caitlyn Bradburn of Seattle and Lindsey Hamilton of Seattle. Finishing second were the “Mavericks” — Ben Martin, Brady Dundas and Robert Grimm. In third, were Dr. Seuss-themed Doug Wood and his daughter Bailey Wood. Fourth was Lisa Davis as Batwoman. And fifth were Eliseo Luna and Carolyn Christensen. The "Ice Queens" head toward the Bundle-Up finish line — and a visit to the beer garden at Saddle Rock Pub & Brewery.